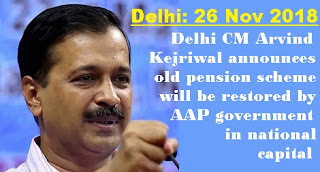 Delhi: Delhi Chief Minister Arvind Kejriwal announced Monday that the old pension scheme will be restored by his government and he will write to his counterparts in other states to follow the suit. He said a resolution to restore the old pension scheme in the city will be passed in a special session of the Legislative Assembly. "It will then be sent to the Centre for approval. I will fight with the Centre to get it implemented," Kejriwal said while addressing a rally organised by the All Teachers, Employees Welfare Association (ATEWA) at Ramlila Ground here. He said that he will also speak to his counterparts in West Bengal, Kerala, Andhra Pradesh and Karnataka for implementation of the scheme. "The government employees have the power to change the government of the country. I want to warn the Centre, if the demand of employees is not accepted in three months, there will be an apocalypse in 2019," the Aam Aadmi Party (AAP) convener said. Slogans like "desh ka neta kaisa ho, Kejriwal jaisa ho" greeted the Delhi chief minister as he made the announcement at the rally. Kejriwal slammed the new pension scheme as "betrayal and cheating" with government employees. "I want to request Modiji that you cannot accomplish nation-building by disappointing the government employees," he said, adding that the AAP government could perform in the areas of education, health, power and water supply only because of the cooperation of its employees. The new pension scheme was introduced by the Centre in 2004. Under it, employees contribute towards pension from their monthly salary along with an equal contribution from their employer. The funds are then invested in earmarked investment schemes through pension fund managers.